Are Amazon and Lyft Making Online Reviews Too Important? I’m really not sure what I think about this, so I’d love to discuss with you on Linkedin or Twitter. As I write this, it’s Thanksgiving Week in the United States, which means millions of people will spend billions of dollars on Black Friday and Cyber Monday, and will temporarily say things like “doorbusters” without a trace of embarrassment. As is the national custom, for almost every conceivable product there are approximately 1,417 competing brands and variations, making the actual purchase process an informational Spartan Race. Hick’s Law states that the more choices we are faced with, the time necessary to make a selection goes up, not down. Increasingly, we try to shortcut this Paradox of Choice by consulting online reviews. I’ve written extensively here on the power of online reviews, and the subject is a major component of my book, Hug Your Haters. Fundamentally, we trust online reviews. Oft-cited research by BrightLocal suggests that 80% of customers trust at least some online reviews as much as they trust recommendations from a friend or family member. And this isn’t just about e-commerce. Fully half of all in-store purchases start by reading online reviews, according to BazaarVoice. But what if reviews became SO IMPORTANT that they didn’t just help us decide but also dictated what was actually available to purchase? It’s already happening. 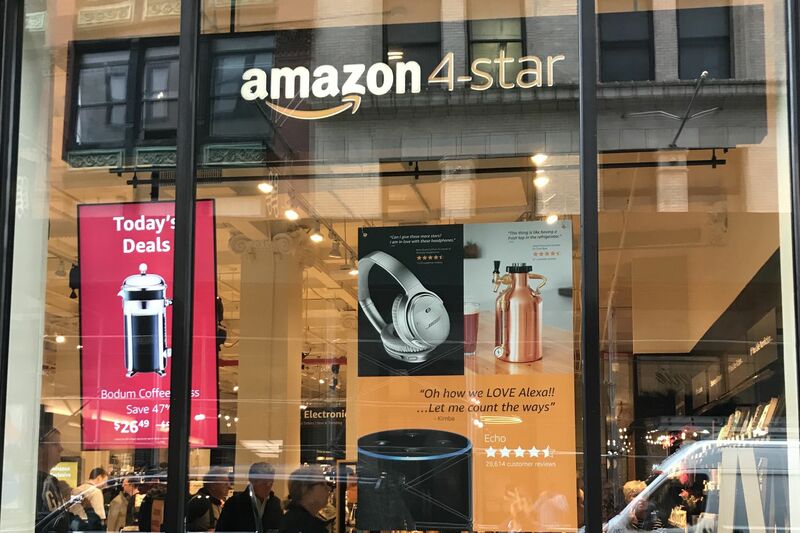 Amazon has opened two retail locations (with more in development) called “Amazon 4-Star“, which sounds like a crappy sneaker brand but is, in reality, an entire store stuffed with a variety of products that have high consumer ratings on the Amazon platform. I have two big questions about this approach. First, are we SO enticed by reviews that we are okay with having the very availability of products dictated by that consumer feedback? Are we so dismissive of a sweater that clocks a 3.9 that we collectively believe it shouldn’t even have the temerity and unmitigated gall to make itself available for purchase? What if Amazon (which also owns Whole Foods and several real-world bookstores) took this 4.0 or above thesis to its logical conclusion: “No products below a 4.0 for sale on Amazon.com, at Whole Foods or in any other Amazon-owned retail outlet.” I don’t see that as particularly far-fetched, and I’m not at all sure that’s a positive outcome for consumers. 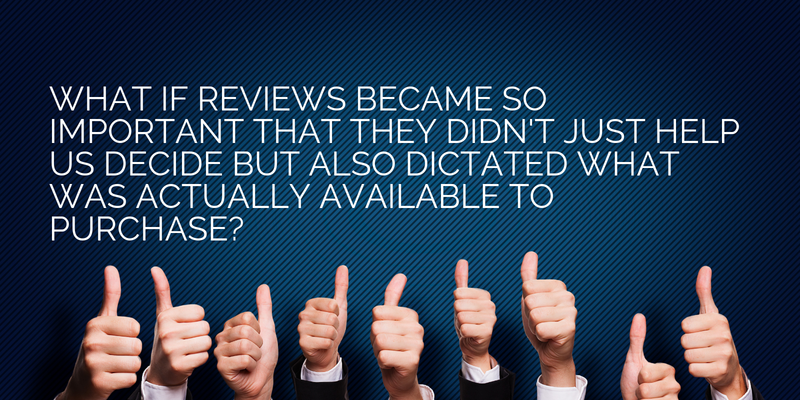 It would lead to rampant review fakery and a LOT of heavy-handed review solicitation. Further, I know we trust reviews in general, but we don’t trust all reviews from all people equally, right? I have a friend. Let’s call him Art, because that’s his name. He is a highly compensated television and commercial director in Hollywood. He actually knows how to make movies, for real. Yet, his actual taste in movies is abhorrent, at least to me. I trust him implicitly about some things, and not at all about others. And isn’t that the way it should be? I don’t want to be a travel snob, but I will be for this paragraph, given that I’m on the road 200 days per year. 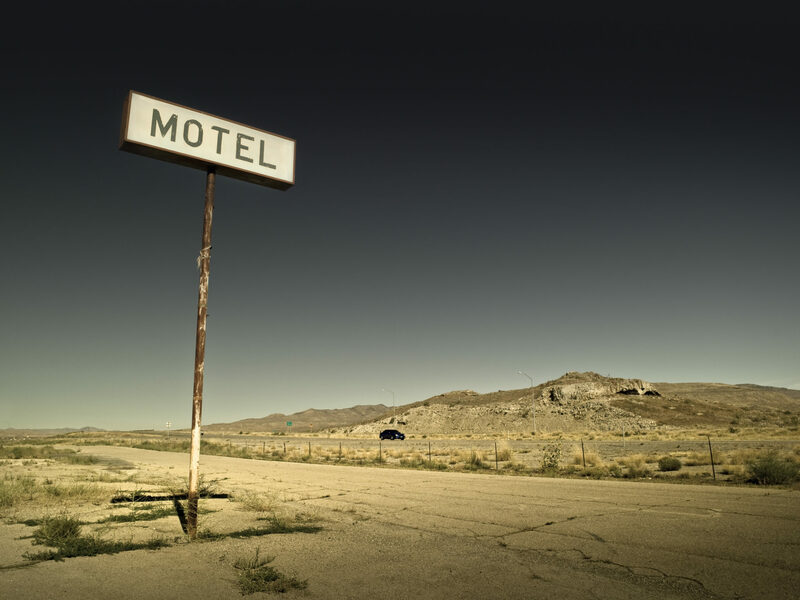 When I read a GLOWING, 5-star review on TripAdvisor for a shabby lodging option called “Motel ONE” located off a dirt road in Alabama, I’m sorry, but I question whether our relative experiences with hotels would lead us to both draw the same mathematical conclusion about the same customer experience. Yeah, I trust reviews. But not enough to limit purchase alternatives based on them. And my second question is, isn’t this really just another genius Trojan Horse for Amazon? Because not only does Amazon 4-star feature an assortment of products that get consistently high marks from Amazon.com shoppers, it also includes a bounty of Amazon-made products, regardless of review scores. Amazon Fire sticks. Myriad Amazon Echo variants. Ring doorbells (owned by Amazon). And an assortment of other Amazon-made clothing, housewares and electronics, some of it made “secretly” by Amazon via their endless faux house brands that pop up overnight, repped by a quickie logo made on 99 Designs. The Amazon brand doesn’t have a tremendous amount of cachet. Partially because they aren’t viewed in the same way as manufacturers like Apple, Microsoft or J Crew — even though they very much are nearly on-par with all of those in terms of actual products manufactured. The Amazon brand is also murky because Amazon itself is murky. It sells everything. It also makes way more money in B2B than it does in B2C. Amazon is everything and, thus, from a brand perspective, nothing at all, other than efficiency (and increasingly, ruthlessness). Because of the weakness of the brand, if Amazon opened up an “Amazon” store in your local mall, adjacent to the Apple store and the Microsoft store, you wouldn’t know what to make of it, would you? You wouldn’t be sure what it would contain? Is it luxury? Discount? Electronics? Entertainment? I’m not sure such a venture would succeed. 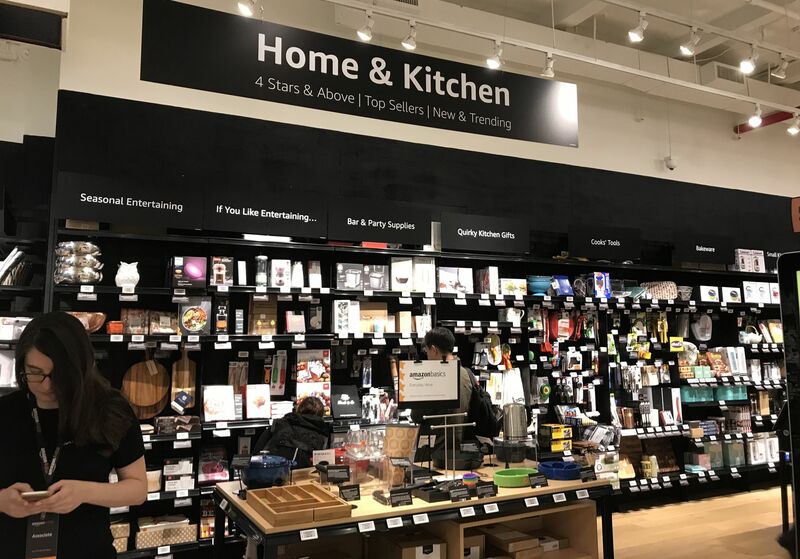 So instead, the smarties in Seattle (for now) said, “What if we created an Amazon store, but instead of relying on our brand to drive foot traffic, we instead used the concept of “highly rated products”? That gives the store a unique reason for existing, and one that cannot easily be adopted by competitors. And it allows Amazon to use the “4-star” robe to conceal its true purpose: moving as much Amazon-built merch as possible. 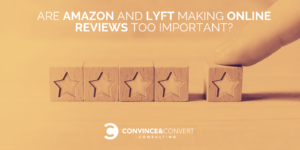 Simultaneous to Amazon extending another tentacle into retail using their “4-star” gambit, Lyft is making big changes to the reviews ecosystem on its platform. How important are reviews to drivers at Lyft, Uber, et al? VERY. In an effort to keep drivers loyal to their platform, Lyft announced this week changes to the system where riders rate drivers at the conclusion of each trip. Now, any time a rider does not explicitly leave a rating, it is counted as a five-star rating. That’s a bit presumptuous! Now, after every 100 rides given, the driver’s lowest rating is automatically deleted from their total. The message here seems to be: it’s okay if you treat passengers poorly; just work harder and we’ll magically eliminate any trace. Now, ANY rating of four stars or below must be explained by the rider. Why is it up to the passenger to take the time to justify their own dissatisfaction? Not to mention the fact that a 4.0 on a 5-point scale isn’t exactly scathing criticism, is it? Part of the problem is the score inflation inherent in a 5-point scale. In my estimation, this is mostly true in ride-hailing apps. You don’t see people feeling bad about giving a crockpot a 3.0 on Amazon but give a driver a 3.0 on Uber and you feel like you just prevented his kids from getting into college. 5 stars means the ride was great and met Lyft standards. Anything lower than 5 indicates that you were unhappy with the ride. Wait. 4 out of 5 means unhappy? If you used a 10-point scale, would 8 out of 10 also mean unhappy? Yes, reviews are important. They are very helpful mechanisms for quickly sorting our options and alternatives. But maybe we’ve swung the pendulum too far toward the “wisdom of the crowd” when stores ONLY include products with reviews, and riders are made to feel guilt and shame for giving a mediocre ride less than a perfect score. Or maybe, I’m all wrong on this one. What do you think? Let me know on Twitter or Linkedin. Thanks.